Spring is upon us, and it is time to start looking toward this year’s Atlantic hurricane season. Readers should be instantly dubious of any hurricane season forecast, such as this one, due to their inconsistent skill. Last year, myself and every major forecasting agency that I know of predicted a more active hurricane season than normal, and we were all wrong. In fact, 2013 turned out to be one of the top 10 least active seasons since 1950, with only 2 hurricanes and an ACE of 34% of normal. In hindsight, there are a couple of possible reasons for this, such as an apparent faltering of the Atlantic thermohaline circulation and the local Atlantic Hadley Cell. Regardless of how well hurricane activity is predicted in advance, you the reader should be aware that nobody can predict individual hurricanes months in advance, and no matter what the season as a whole is like, there is always the potential for a hurricane to form and impact you. Hurricane Andrew destroying south Florida during the otherwise completely quiet 1992 hurricane season is the poster child example of this. 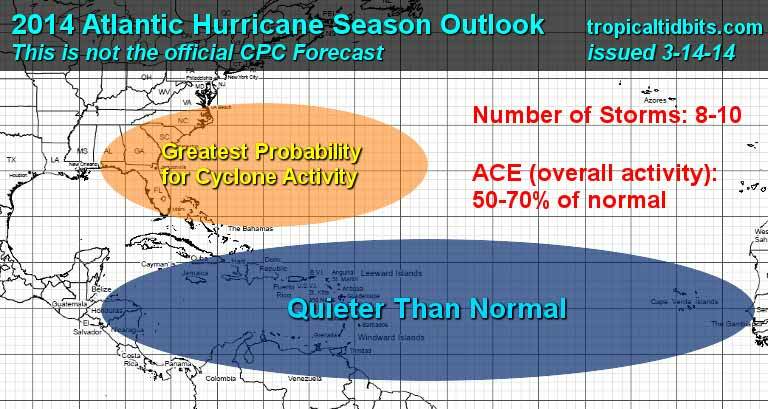 With this in mind, and despite forecasting failures like 2013, meteorologists can usually glean useful insight into how active the hurricane season will be before it has even begun. Here, I will offer my thoughts on what 2014 may bring. The video above is there so that I don’t have to type a long post and so you don’t have to read a long-winded analysis. Some basic points are outlined here, but watch the video discussion for details. Current global sea surface temperature (SST) anomalies reflect a decaying La Nina and negative PDO, which is now more like a positive PDO. An El Nino is expected to develop this summer due to an impressive Kelvin wave likely to bring warm water to the surface of the equatorial Pacific. Both of these climate regimes tend to shut down Atlantic tropical activity through enhanced wind shear over the main development region and displacement of upward motion away from the tropical Atlantic. We are also in a unique place in the ENSO cycle wherein it has been 46 months since El Nino conditions were last seen, an impressively long period in the context of the last 65 years. We may expect, then, that at least some major aspects of the Atlantic hurricane season will be similar to other El Nino years that followed a long period of neutral or La Nina conditions. If we take 10 such seasons since 1950: 1957,1963,1968,1972,1982,1986,1991,1994,2002, and 2009, the average storm count is 8 (normal is 12) and the ACE averages ~52% of normal. This is likely a good first approximation for 2014. Below is a map showing the anomaly of tropical cyclone frequency (storms/year) in 1×1 degree grid boxes for the analog years mentioned. Note the great lack of activity in the deep tropics. However, an area of above-normal activity shows up off the SE U.S. coast, coinciding with the area of low wind shear during El Nino years. These years also tend to have warm SSTs in that area, and if we look at the SST map earlier in the post, we see very warm water off the SE U.S. contrasting the cold water off of Africa. This suggests a very quiet Cape Verde season and less activity than normal for the deep tropics in general, but perhaps a window for storms to form in the subtropics where the water is anomalously warm east of the U.S. and in the vicinity of Bermuda and the central Atlantic. If we now look at the best composite analogs (using SST, MSLP, and Z500) for the North America region for the month of February, we see that several of the analogs similar to this winter are also in the ENSO analogs I gave earlier. If we take the intersection of these lists and look at the TC frequency anomaly, the same pattern is still evident, with a generally inactive Atlantic except for the SW Atlantic region. The climate models generally agree with this type of pattern in the Atlantic this summer, with a very dry tropical Atlantic void of much tropical activity, but perhaps a slightly more favorable pattern off the SE US coast, promoting home-grown storms close to the coast, as well as storms out in the middle of the central Atlantic away from everyone except Bermuda. With the likelihood of El Nino increasing, perhaps a strong one, and the climate models agreeing with the general pattern seen in the historical analogs I have outlined, a generally quiet Atlantic hurricane season is expected for 2014, similar to last year in many respects. Last year was so quiet, however, that based on probability alone, 2014 is likely to be perhaps slightly more active. The deep tropical breeding grounds are likely to be less active than normal, and storms that do form will likely tend to form farther north in the subtropics, either out in the middle of the Atlantic, or closer to the southeast U.S. coast, which would make the eastern seaboard the most likely region to see any potential landfalls. However, as always, a storm could make landfall anywhere during any season. Stay safe this year. I am someone who constantly looks at the weather and tries to figure out what the current weather pattern may bring in the days, weeks and even months ahead; so, here is what I’m seeing in the data that could impact the 2014 Atlantic Hurricane Season. The latest sea surface temperatures continue to show a weakening La Nina and I continue to expect that an El Nino will develop this summer and likely will continue through the autumn and into the winter of 2014-15. A typical El Nino usually shuts down tropical cyclone formation across the Atlantic due to higher than average wind shear, especially across the zone from the coast of Africa to the Lesser Antilles. Sometimes during this sort of setup we see an area of lower wind shear develop near the US Southeast coast, western Caribbean and across parts of the Gulf of Mexico. The current sea surface temperature profile over the Atlantic Basin features colder than average sea surface temperatures over the zone between the Lesser Antilles and the coast of Africa and warmer than average sea surface temperatures from near Bermuda westward to near the US Southeast coast. This sort of sea surface temperature pattern if it combines with the expected El Nino may mean that tropical disturbances tracking off of Africa may struggle until they get west of 60 to 65 West Longitude; meaning this could be a season of in-close development and homebrew tropical development near the US Southeast coast, the Bahamas, the western Caribbean and into parts of the Gulf of Mexico. The latest data that I’m looking at continues to point to that the years 1957, 1963, 1972, 1991 and 1994 are fairly close analog years given the current upper air pattern and the sea surface temperature profile. All of these years had either a close brush or a direct impact of a tropical storm or hurricane on the United States or the Caribbean, even though the overall storm numbers were low in all of these years. The top 9 cold winters across the northern and northwestern Gulf coast are: 1976-77, 1898-99, 1972-73, 2000-01, 1983-84, 1904-05, 1911-12, 1929-30, 1978-79. All of these winters had at least one tropical storm or hurricane landfall in the United States or the Caribbean. Three of these seasons had a major hurricane landfall (1899, 1984 and 1979). Another index that I continue to monitor is the amount of instability or how much unstable air there is across the Atlantic, Gulf of Mexico and Caribbean. The current trend is for higher than average unstable air across the Gulf of Mexico and near the US East Coast; near average amounts of unstable air across the Caribbean and well below average amounts of unstable air (meaning the atmosphere is very stable) over much of the central and eastern Atlantic. Should this continue right into this upcoming hurricane season, then we could see any systems struggling to develop until they reach about 60 to 70 West Longitude; therefore, it may be a season of late bloomers and development close to the coast of the United States or right in the vicinity of the Caribbean Islands, which is exactly what all of the other parameters are indicating right now. Based on my latest analysis of all of the data available, it looks likely that we will have El Nino conditions by this summer with a weak to moderate El Nino expected right through this upcoming autumn and possibly into the winter of 2014-15. I think we will see a low number of overall storms, however, given the current pattern of warm waters near the US coast, the possibility of an area of lower wind shear near the US Southeast coast, western Caribbean and parts of the Gulf of Mexico and higher than average amounts of unstable air in the Gulf of Mexico and near the US East Coast, I think that we will need to closely watch the western Caribbean, Gulf of Mexico, near the Bahamas and near the US Southeast coast for in-close and homegrown tropical development. As I have mentioned before we have to be very careful to not concentrate on the number of named storms as there are signals in the data that we may see at least one tropical storm or hurricane landfall somewhere along the United States coastline or in the Caribbean. My advice is to prepare for this Hurricane season the same way as you do for any other season. Put together or restock that Hurricane supply kit and always keep checking with us for the latest information on any tropical weather threats. Given the continuing fact that we will be in El Nino conditions this summer and autumn and could last right through the winter of 2014-15, I think that there will be less activity than average south of 20 North Latitude. North of the 20 North Latitude line, I continue to have concerns about in-close development and home grown development near the US southeast coast, the Bahamas and near the Gulf Coast. Additionally, we will have to closely monitor the possibility of a Modoki El Nino instead of a normal sort of El Nino conditions. A Modoki El Nino leads to higher storm activity than what you would see in a normal El Nino. This is something that is not certain, but is certainly something that needs to be watched for. I think we could see a hurricane season that features tropical disturbances that struggle east of 60 West Longitude, but then go ahead and develop and strengthen as they track west of 65 West Longitude. This means we could have a season of in-close development and homebrew tropical development near the US Southeast coast, the Bahamas, the western Caribbean and along the entire Gulf Coast. The latest data that I’m looking at continues to point to that the years 1957, 1963, 1972, 1991 and 1994 are fairly close analog years given the current upper air pattern and the sea surface temperature profile. Not only did all of these years have close brushes or direct impacts of tropical storms or hurricanes on the United States or the Caribbean, but these storms also led to high impacts on areas they made landfall. Based on my latest analysis of all of the data available, it looks likely that we will have El Nino conditions by this summer with a weak to moderate El Nino expected right through this upcoming autumn and possibly into the winter of 2014-15. I think we will see a low number of overall storms, however, given the current pattern of warm waters near the US coast, the possibility of an area of lower wind shear near the US Southeast coast, western Caribbean and parts of the Gulf of Mexico and higher than average amounts of unstable air in the Gulf of Mexico and near the US East Coast, I think that we will need to closely watch the western Caribbean, Gulf of Mexico, near the Bahamas and near the US Southeast coast for in-close and homegrown tropical development that would lead to less than the average amount of time to prepare for the tropical storm or hurricane; meaning, they could very well be strengthening right up to landfall. My next scheduled tropical weather post will be right around April 10th and will contain my thoughts and observations with Colorado State University's seasonal hurricane forecast. Colorado State University (Dr. Phil Klotzbach & Dr. William Gray) released their April forecast for the upcoming 2014 Atlantic Hurricane Season. In their latest forecast, they are predicting a total of 9 named storms with 3 of those storms becoming hurricanes and 1 of those of hurricanes becoming a major hurricane (Category 3, 4 or 5). Their forecast can be read at http://hurricane.atmos.colostate.edu/Forecasts/2014/apr2014/apr2014.pdf. The forecast indicates that at least a moderate El Nino will develop this summer and fall. This is something that I have already indicated in my previous posts and I fully agree with this. Additionally, they put forth some analog years to which this year may end up like based on the current conditions. The analog years that they have used in their forecast include: 1957, 1963, 1965, 1997 and 2002. 1957 had Hurricane Audrey which impacted the upper Texas coast and southwestern Louisiana in late June as a Category 4 hurricane. 1963 had Category 1 Hurricane Cindy make landfall along the upper Texas coast in mid-September. Additionally, Hurricane Ginny almost made landfall along the New England coast in late October, but ended up passing just offshore making landfall in Nova Scotia instead. 1965 had Category 3 Hurricane Betsy make a major impact on not only south Florida, but also made a second landfall in southeastern Louisiana during early and mid September. 1997 had Hurricane Danny which made landfall as a Category 1 hurricane along the northern Gulf coast during the last half of July. Finally, in 2002, it seemed that every storm made landfall along the Gulf Coast or along the US Southeast coast with Isidore and Lili being the most impactful storms that year. So, let’s not concentrate on the number of named storm as there continues to be signals in the data that points to at least one tropical storm or hurricane landfall somewhere along the United States coast or somewhere in the Caribbean (or both). My advice is to prepare for this Hurricane season the same way as you do for any other season. Put together or restock that Hurricane supply kit and always keep checking with us for the latest information on any tropical weather threats. At this point, it is something to watch for, however, I have serious doubts that it will happen and think that the end result will be somewhere in-between all of these scenarios, which is potentially something such as a low pressure system tracking just offshore of the US East Coast around the April 20th to April 24th time frame that brings gusty winds, rough surf and showers along much of the Eastern Seaboard of the United States. AccuWeather released their 2014 Atlantic Hurricane Season forecast yesterday and they expect 10 named storms with 5 of those storms becoming hurricanes and 2 of those hurricanes becoming major hurricanes (Category 3, 4 or 5). AccuWeather is expecting an overall low number of storms due to a developing El Nino. This is something that I have already indicated that I expect and agree with in many of my previous posts from March and April. While I agree with the forecast of a low number of storms, this should not be taken lightly as I continue to have significant concerns regarding in-close development and home grown development that could either threaten or directly impact the US Gulf Coast, the Bahamas and the US Southeast Coast. I cannot stress this point enough – Just because there may be a low number of storms, you should not let your guard down or think that you don’t have to worry. All it takes is one storm or hurricane to ruin or devastate your property. Begin making preparations today for the Hurricane Season. Put together or restock that Hurricane supply kit. Once a storm or hurricane is on its way, it’s almost too late. In fact, I think that we will see 1 to 2 tropical storms or hurricanes make landfall this season somewhere along the US Gulf Coast, across the Bahamas or along the US Southeast Coast. As for the Caribbean, while the main impact threat may end up staying north of the Caribbean, it does not mean that a tropical storm or hurricane will not affect the Caribbean, especially the central and western Caribbean. In my opinion, I envision this season to start out quick with maybe 2 to 3 named storms during June and July. In fact, there are signals in the data that point that a weak upward motion pulse of the Madden Julian Oscillation will arrive in the eastern Pacific and western Atlantic in about 7 to 10 days from now which could last into early June. During a developing El Nino like we have now, these types of weak signals in the Madden Julian Oscillations are sometimes correlated with early season Atlantic tropical cyclone development. In fact, moderate to strong El Niño’s sometimes feature a burst of early Atlantic tropical development. This is why I think we may have 2 to 3 named storms during June and July. I do think that given the weak upward motion pulse of the Madden Julian Oscillation that we may see some sort of tropical development in the western Caribbean between June 1st and June 10th. What is the Madden Julian Oscillation? Basically, it is a weather circulation that traverses the globe every 45 to 60 days. During times of upward motion pulses of the Madden Julian Oscillation, you will see a marked increase in thunderstorm development and if the environmental conditions are favorable, you may see an increased chance for tropical development. Finally, given the idea that we may be in a moderate to even strong El Nino by this fall that it is possible that the Hurricane season peaks earlier than average, say during the month of August and then it may shut down earlier than average, possibly as early as late September with little or no development during October and November due to the very hostile environmental conditions that are found with El Niño’s. Following a season with the fewest number of hurricanes since 1982, the 2014 Atlantic hurricane season is expected to follow suit as a below-normal hurricane season. With roughly 10 named tropical storms, five hurricanes and two major hurricanes predicted for the Atlantic Basin this season, AccuWeather.com's long-range forecasting team anticipates two storms, either tropical storms or hurricanes, to make landfall in the United States. "If we have a robust El Niño develop, then the numbers will be much lower and this could be one of the least active years in recent memory," AccuWeather.com Senior Meteorologist Dan Kottlowski said. "All we need is one hurricane," Kottlowski said. "Just because we are saying this is going to be an inactive season doesn't mean we couldn't have a couple of very intense hurricanes." The Atlantic hurricane season starts in just over a week, and long-range models are already pointing to the possibility that the Western Caribbean will be capable of brewing the season's first "Invest" during the first week of June. But so far, the major hurricane forecasting groups are not impressed with this season's potential to be an active one. 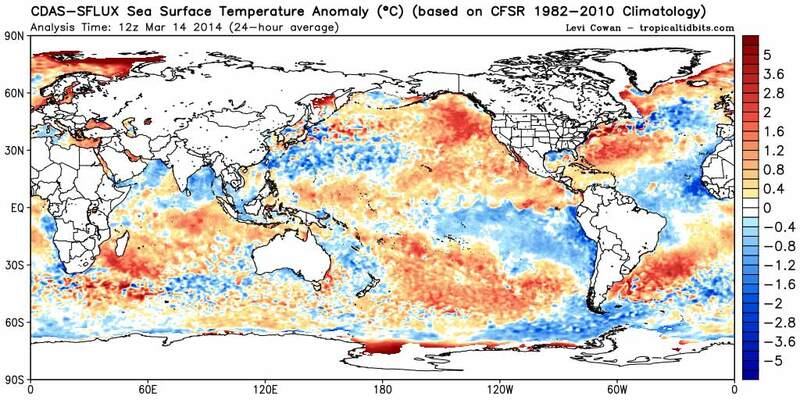 They are calling for 2014 to be a below average to near-average year for the Atlantic. NOAA's prediction, issued this Thursday morning, forecasts a 50% chance of a below-normal season, a 40% chance of an near-normal season, and only a 10% chance of an above-normal season. They predict a 70% chance that there will be 8 - 13 named storms, 3 - 6 hurricanes, and 1 - 2 major hurricanes, with an Accumulated Cyclone Energy (ACE) 40% - 100% of the median. If we take the midpoint of these numbers, NOAA is calling for 10.5 named storms, 4.5 hurricanes, 1.5 major hurricanes, and an ACE index 70% of normal. This is below the 1981 - 2010 average of 12 named storms, 6 hurricanes, and 3 major hurricanes. Hurricane seasons during the active hurricane period 1995 - 2013 have averaged 15 named storms, 8 hurricanes, and 4 major hurricanes, with an ACE index 151% of the median. 1) An El Niño event is predicted for the summer and fall, which is expected to bring strong wind shear-inducing upper-level winds over the Tropical Atlantic. Vertical wind shear during the past 30 days was stronger than average across much of the Main Development Region (MDR) for hurricanes, from the coast of Africa to the Caribbean. Sinking air at mid-and upper-levels was also stronger than average. The development of El Niño would mean a likely continuation of these non-conducive conditions, and both versions of NOAA's long-range CFS model are predicting enhanced vertical wind shear across the western MDR during August-September-October 2014. Strong vertical wind shear and sinking motion, linked to a rare jet stream pattern of record strength, were key suppressing factors during the unexpectedly quiet 2013 Atlantic hurricane season. 2) Sea Surface Temperatures (SSTs) are near average in the MDR. 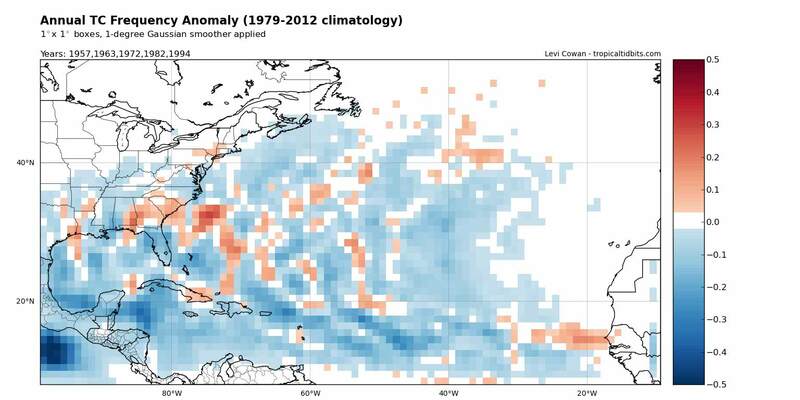 Many long-range dynamical computer forecast models are predicting that SSTs in the MDR will remain near- or below-average throughout the hurricane season. 3) We are in an active hurricane period that began in 1995, and this positive phase of the Atlantic Multi-decadal Oscillation (AMO) may act to keep hurricane activity higher than it would otherwise be. Figure 1. Category 4 Hurricane Lili in the Gulf of Mexico at 16:45 UTC on October 02, 2002. Lili was the strongest hurricane of 2002, a year that the Colorado State seasonal forecast team lists as an analogue for 2014. Lili weakened to a Category 1 storm before hitting Louisiana, causing just under $1 billion in damage. The CSU team picked five previous years when atmospheric and oceanic conditions were similar to what they expect for this year: moderate El Niño conditions, neutral to slightly cool sea surface temperatures in the tropical Atlantic, and a positive phase of the Atlantic Multi-decadal Oscillation (AMO). Those five years were 2002, which featured two major hurricanes that got their names retired: Lili and Isidore; 1997, a quiet year with only 8 named storms and 3 hurricanes; 1965, a quiet year with only 6 named storms (but one of these was a real doozy--Hurricane Betsy, which struck Louisiana as a Category 3 storm;) 1963, with 9 named storms and 7 hurricanes, including Cuba's deadliest hurricane of all-time: Hurricane Flora (8,000 killed); and 1957, a below-average year with 8 named storms and 2 major hurricanes, including June's deadly Hurricane Audrey, which was re-analyzed as a Category 3 storm this year. The average activity during these five analogue years was 9 named storms, 4 hurricanes, and 2 major hurricanes. The CSU team will issue an updated forecast on Monday, June 2, 2014. Figure 2. Comparison of the percent improvement in mean square error over climatology for seasonal hurricane forecasts for the Atlantic from NOAA, CSU and TSR from 2004-2013, using the Mean Square Skill Score (MSSS). The figure shows the results using two different climatologies: a fixed 50-year (1950 - 1999) climatology, and a 2004 - 2013 climatology. Skill is poor for forecasts issued in December and April, modest for June forecasts, and good for August forecasts. Image credit: Tropical Storm Risk, Inc. The April 7 forecast for the 2014 Atlantic hurricane season made by British private forecasting firm Tropical Storm Risk, Inc. (TSR) calls for a near-average season with 12 named storms, 5 hurricanes, 2 intense hurricanes, and an Accumulated Cyclone Energy (ACE) of 75. The long-term averages for the past 64 years are 11 named storms, 6 hurricanes, 3 intense hurricanes, and an ACE of 102. TSR rates their skill level as modest for these April forecasts: 7 - 15% higher than a "no-skill" forecast made using climatology. They project that 3 named storms will hit the U.S., with 1 of these being a hurricane. The averages from the 1950-2013 climatology are 3 named storms and 1 hurricane hitting the United States. TSR rates their skill at making these April forecasts for U.S. landfalls just 5% - 8% higher than a "no-skill" forecast made using climatology. In the Lesser Antilles Islands of the Caribbean, TSR projects one named storm and no hurricanes in 2014. Climatology is 1.1 named storms and 0.5 hurricanes. 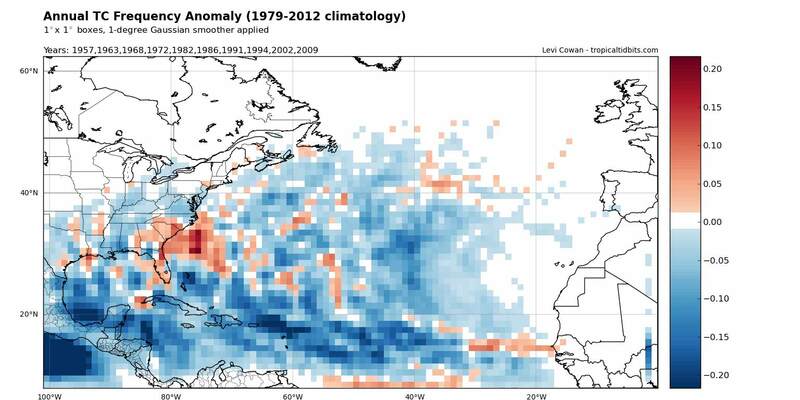 TSR's two predictors for their statistical model are the forecast July - September trade wind speeds over the Caribbean and tropical North Atlantic, and the forecast August - September 2013 sea surface temperatures (SSTs) in the tropical North Atlantic Main Development Region (MDR) for hurricanes. Their model is calling for SSTs 0.32°C below average and trade winds 1 m/s stronger than average during these periods; both of these factors should act to decrease hurricane and tropical storm activity. The July-September 2014 trade wind prediction is based on an expectation of moderate El Niño conditions in August-September 2014. TSR will issue an updated forecast on May 27, 2014. A statistical model by Penn State's Michael Mann, alumnus Michael Kozar, and researcher Sonya Miller is calling for a quiet Atlantic hurricane season with 9.3 named storms, plus or minus 3 storms. Their prediction was made using statistics of how past hurricane seasons have behaved in response to sea surface temperatures (SSTs), the El Niño/La Niña oscillation, the North Atlantic Oscillation (NAO), and other factors. The statistical model assumes that the mid-May 2014 0.29°C above average SSTs in the MDR will persist throughout hurricane season, a moderate El Niño will be in place, and the North Atlantic Oscillation (NAO) will be near average. The PSU team has been making Atlantic hurricane season forecasts since 2007, and these predictions have done pretty well, except for in 2012, when an expected El Niño did not materialize. 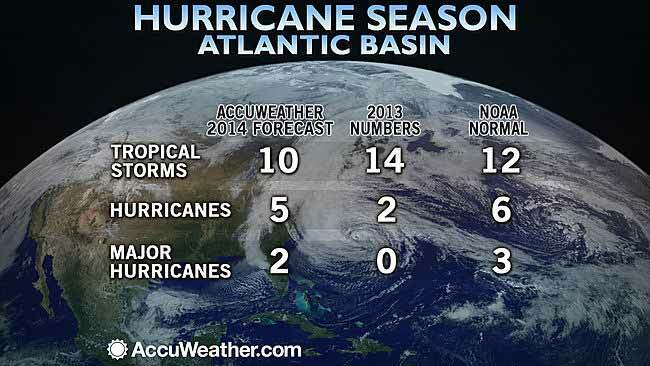 They were the only major forecast group that issued a successful 2013 Atlantic hurricane season forecast. As is usually the case when an El Niño event is threatening, NOAA's pre-season prediction for the Eastern Pacific hurricane season, issued on May 22, is calling for an active season. NOAA expects there to be 14 - 20 named storms, 7 - 11 hurricanes, 3 - 6 major hurricanes, and an ACE index 95% - 160% of the median. The mid-point of these ranges gives us a forecast for 17 named storms, 9 hurricanes, and 4.5 major hurricanes, with an ACE index 127.5% of average. The 1981 - 2010 averages for the Eastern Pacific hurricane season are 15 named storms, 8 hurricanes, and 4 major hurricanes. The outlook calls for a 50% chance of an above-normal season, a 40% chance of a near-normal season, and a 10% chance of a below-normal season. El Niño decreases the vertical wind shear over the tropical Eastern Pacific, favoring the development of more and stronger tropical cyclones. Since 1995 the Eastern Pacific has been in an era of low activity for hurricanes, but this pattern will be offset in 2014 by the impacts of El Niño. NOAA's pre-season prediction for the Central Pacific hurricane season, issued on May 22, calls for a near-normal or above-normal season, with 4 -7 tropical cyclones. An average season has 4 - 5 tropical cyclones, which include tropical depressions, tropical storms, and hurricanes. The outlook calls for a 40% chance of a near-normal season, a 40% chance of an above-normal season, and a 20% chance of a below-normal season. El Niño decreases the vertical wind shear over the tropical central Pacific, favoring the development of more and stronger tropical cyclones. Since 1995 the central Pacific has been in an era of low activity for hurricanes, but this pattern will be offset in 2014 by the impacts of El Niño. Hawaii is the primary land area affected by Central Pacific tropical cyclones. Quiet hurricane seasons with below-average activity can still produce major hurricanes that cause massive devastation. The five seasons that CSU lists as analogue years for 2014 produced five hurricanes that had their names retired, including one that killed 8,000 people in Cuba (Flora of 1963) and one that killed over 400 people in Texas and Louisiana (Audrey of 1957.) Even if an El Niño does develop this year, that doesn't mean it will be a quiet season. Recall the El Niño year of 2004, when four major hurricanes pounded the U.S.--Ivan, Charlie, Jeanne, and Frances. Those of you in Hurricane Alley should prepare for the 2014 season the same way you would for a predicted hyperactive season, and be ready for the Storm of the Century to hit your location. Thanks Bro, I feel much better now! lets build up lighthouse REEF first!!!!!!!!! 42% is a failing grade. Let us pray for fail this year, but be ready to move when the time is right.